DooKashi for Poultry eliminates odor and reduces disease-producing microbes that cause an irritating by-product of having chickens, ducks and other poultry: odor! Plus, healthy chickens means healthy egg production. Backyard chickens are becoming very popular however, remember to be a good neighbor and reduce chicken odor from their coop. Use DooKashi in the coop and get no more complaints (only neighbors hoping for eggs!). At DooKashi®, we chose for our products to become Non-GMO Project Verified, because we respect the right of pet owner’s rights to feel confident in the safety of any product used around pets. Have a Promo Code? Lucky you! Enter it in "Coupon Code" box after adding to shopping cart. Store sealed in dry area away from direct sunlight. Use opened package within two years. Handle chicken coop oder very well. Thanks. Saw on Fresh Eggs Daily & Bought! I use DooKashi in the coop!! Works great!! Keeps that odor down..
Love this product! Got a sample in my Henny and Roo box. I tried it in my brooder in my house bathroom and it immediately took the stench out of the air! It is a breath of fresh air! I ordered 2 big bags as I always have a brooder going! DooKashi for poultry is wonderful. Not only does it take the stink out of my coop, but the girls can eat it and do eat it and love it. Thank you. This is a great product.! 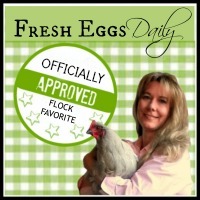 I first started using Dookashi in the chicken coop when I had week old chicks. This product cleaned up the urine and waste odor problem immediately. I give Dookaski an excellent review. Also, my chicks are now six months old and love the taste of Dookashi. They eat it out of my hands. Trying it in my kitty's litter box. Click the button below to add the DooKashi For Poultry to your wish list.